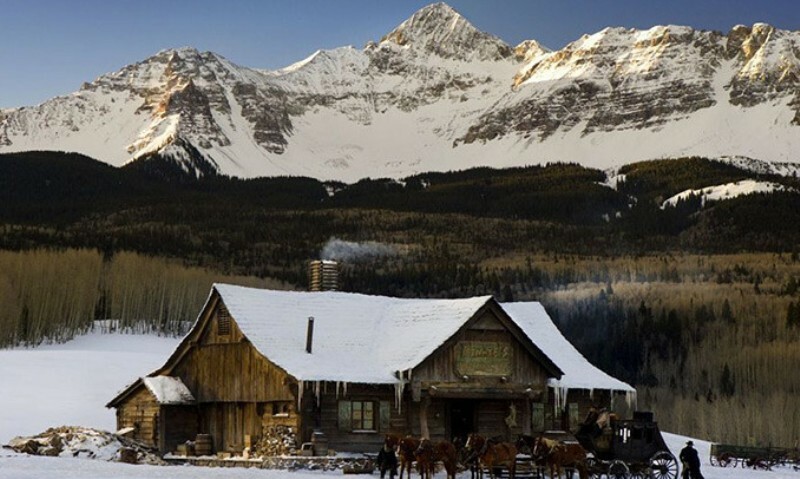 Bounty Hunter John Ruth (Russell) is on his way to collect the bounty for Daisy Domergue (Leigh), a wanted killer, when he is forced to stop at Millie's Haberdashery to seek shelter from an incoming storm. What he doesn't expect to find is a group of men who are also holed up, each of which has reason and incentive to collect the bounty for themselves. I always have really high expectations for Quentin Tarantino films and anticipation for this one has been off the charts for some time. After the success of Django Unchained, it just felt right for the director to go back into the same genre to see if he could strike gold yet again. While this film is mostly a great piece of cinema, I feel it falls a little short of those aforementioned expectations and the end result actually tells me that another Western may not have been the best idea as it feels a little redundant. 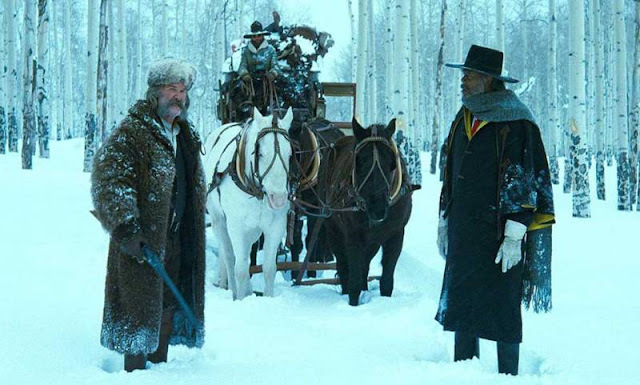 Sure, the acting is great, the dialog is mostly brilliant, and the artistry is all there but, in the inevitable comparison to Django, it falls short in each category. Again, keep in mind, I am already setting this film, and all of Tarantino's at a very high bar so please don't get the impression that I didn't like this movie, it will be listed as one of my favorites of the year. One of the things I feel needs to be addressed, although I understand why Tarantino does it, is the wanton use of the infamous "N" word throughout the film which is more than a bit tiring and loses its desired effect about halfway through the picture. Like I said, I get it, it fits in with the times and how people talked back then but holy crap, tone it down just a little bit. The constant barrage felt like the word was being used more as punctuation than as language or part of speech. Outside of that one gripe, I have to say Tarantino, as a writer, remains one of the best in the business at creating real emotion and powerful moments from what would, in lesser hands, come off as minutia or overly ordinary conversations. He is so good at making exposition entertaining, you don't even realize he is simply pushing plot at you because the dialog combined with the performances he draws from the cast are just outstanding to watch. 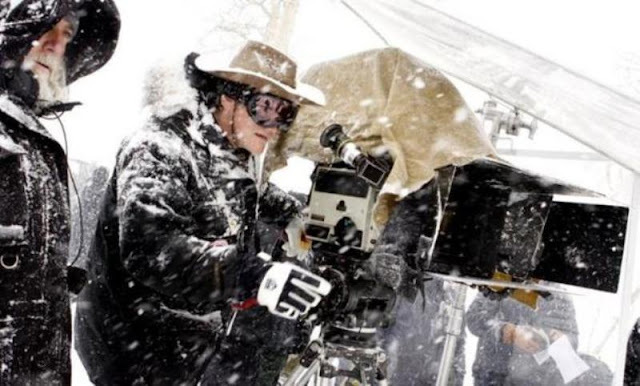 Tarantino has built a roster of talent that he is able to work with over and over, guys like Samuel L. Jackson and Tim Roth being prime examples. Kurt Russell, Walton Goggins, and Michael Madsen have also been long time contributors and always bring their A game to the table. While this repeat casting does contribute to the redundancy factor that, for me, takes this film down a notch, it's hard to knock any or all of them for what they put into making this film. I'm not going to single out any one in particular, but I will say that this is easily the best ensemble performance of the year and should be recognized as such. Hold on, I have to back up a second. Jennifer Jason Leigh is amazing in this film and I would say is the most entertaining out of everyone. She is smart, funny, and plays the character in such a way that you are immediately convinced she is either the craziest person in the room, the smartest person in the room, or some combination of both. As I was saying, the effort thrown into this film by the entire cast is really top notch and especially when it comes to some of the more brutal and bloody scenes that must have been hard to pull off. 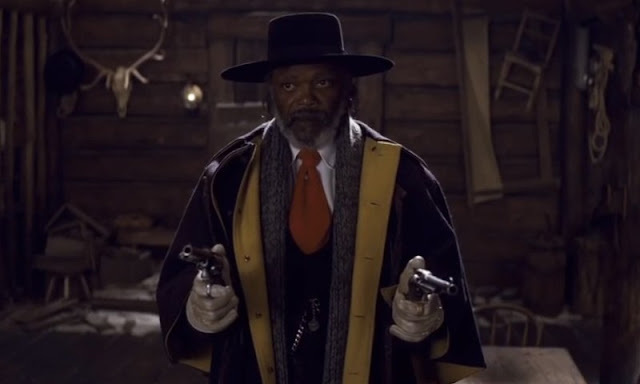 Yes, there are moments during this film that are hard to watch and, while I recommend using caution, you should also know what to expect from a Tarantino film going in. 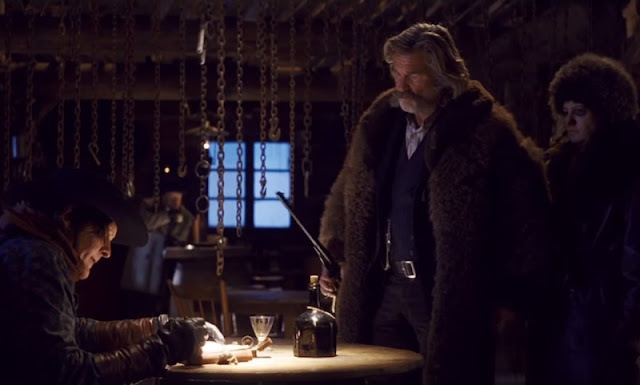 The Hateful Eight is one of my favorite films to come out this year even though it didn't quite meet my lofty expectations. 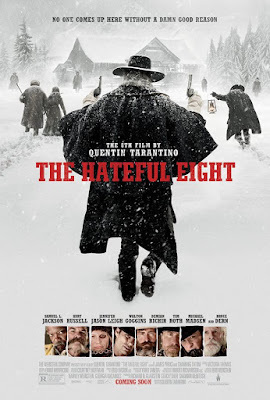 Tarantino does all the things really well that he normally does and the cast, working for him, is outstanding as well. There's always going to be a few issues with any film and the ones here are very minor. 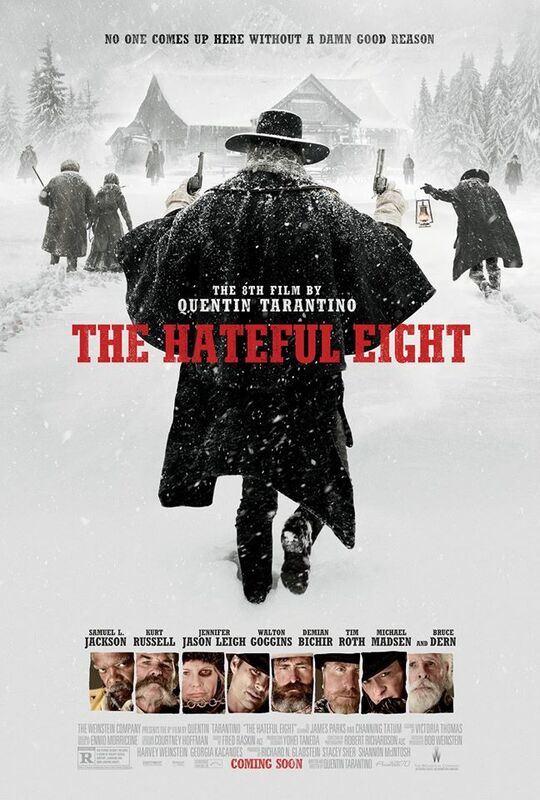 If you are a fan of Quentin Tarantino's films, you will most likely really enjoy this one. If you are not a fan, this will do nothing to change that so take that for what it is.